David A. Schorsch - Eileen M. Smiles American Antiques 358 Main Street South Woodbury, CT 06798 www.schorsch-smiles.com Forty-five Star Flag Sign Board American, 1902 White pine, two-sided, original painted decoration, 14 x 24 inches. 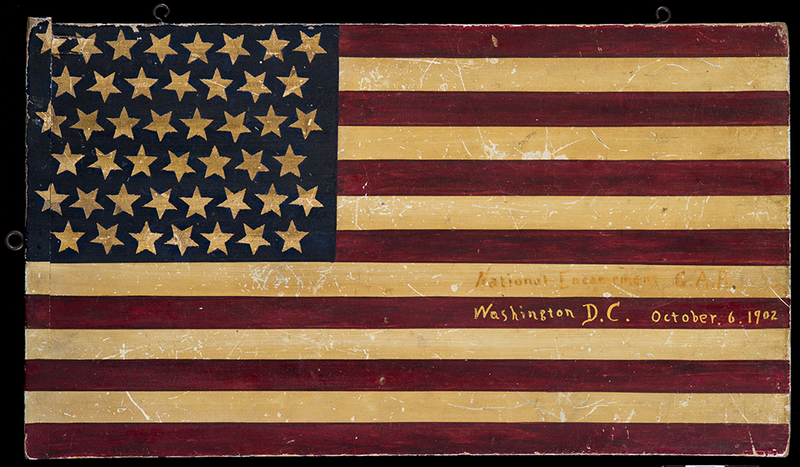 Inscribed in gold metallic paint "National Encampment G.A.R. Washington, D.C. October 6, 1902." Retains original iron ring hangers and an undisturbed crystallized resign-based coating.